As growers, it is hard to imagine a planting or harvest season without checking the 10-day forecast update at 5pm. Weather and climate models have become an integral part of our daily lives. But do we really know how to use these models effectively? It is very important to understand the subtle differences between model types and exactly what they can tell us. In the rapidly changing world of technology, it can be easy to mistake a new or redesigned website for a new improved climate model. Different forecast suppliers may source their data from the same model, but present it in different ways providing a misleading sense that multiple models are saying the same thing. It doesn’t take long before our cognitive biases kick in and we start to dismiss the data that doesn’t support our belief. The human brain has been proven to be fallible and will happily ignore statistics in favour of more convenient conclusions. Nobel prize winner and behavioural scientist Daniel Kahneman found that a disproportionate 90 per cent of motor vehicle drivers believed they had above-average driving skills. Similarly, when we receive a dry forecast we can often put the blinkers on and dismiss this unwanted news with a casual ‘it won’t happen to me’. We need to find a systematic way to deal with the layers of information available to us while still being aware of the potential for inaccuracies inherent in our decision making. It’s time to look beyond the pretty colours and work out whether the models are showing a true departure from the norm. Weather models have a zero- to eight-day lead time and are typically updated twice a day. They are deterministic, for instance, ‘you will get 12mm of rain tomorrow’ and failure can often lead to frustration. Growers who check multiple weather sites to gain a bigger data sample may see the same news and feel it is a certainty, but often the data is all sourced from a single model. Worryingly, some international models can provide generous estimates for upcoming rainfall events. 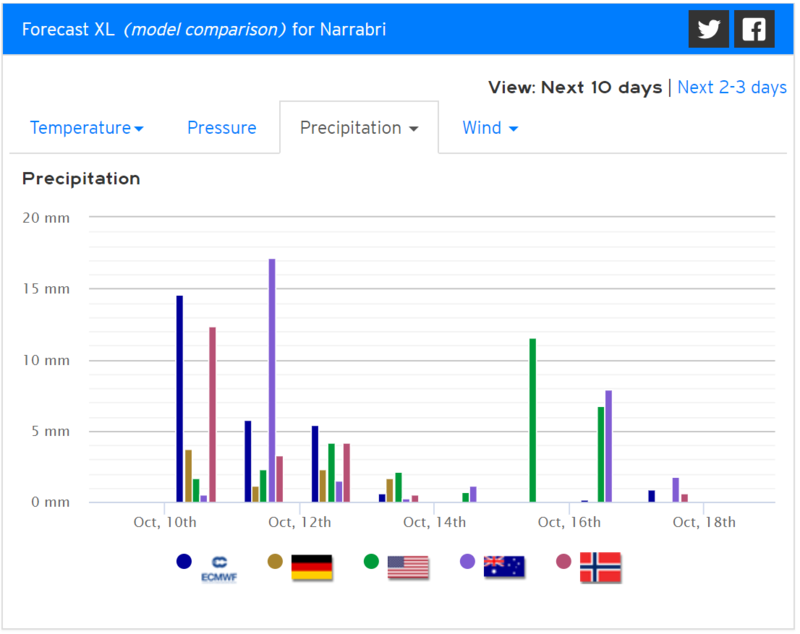 The Meteologix weather forecast XL can help you get a better understanding of what the different models are saying in a clear, visual display (Figure 1). Meteologix charts show the degree of scatter among models and offer more of a probabilistic distribution, rather than a deterministic output. Figure 1. Meteologix* can provide a tailor-made 10-day weather model distribution chart for your location that shows the variation between different models. © 2018 Kachelmann GmbH. *Meteologix chart reproduced in line with Meteologix terms and conditions. With eight- to 30-day lead times, the multi-week models, such as Tropical Tidbits, are probably the most useful for making decisions around weather-dependent activities such as fungicide spraying or harvest, where growers may need time to coordinate farm input supplies or mobilise contractors. These models are generally run once or twice weekly and their predictions can change over time. 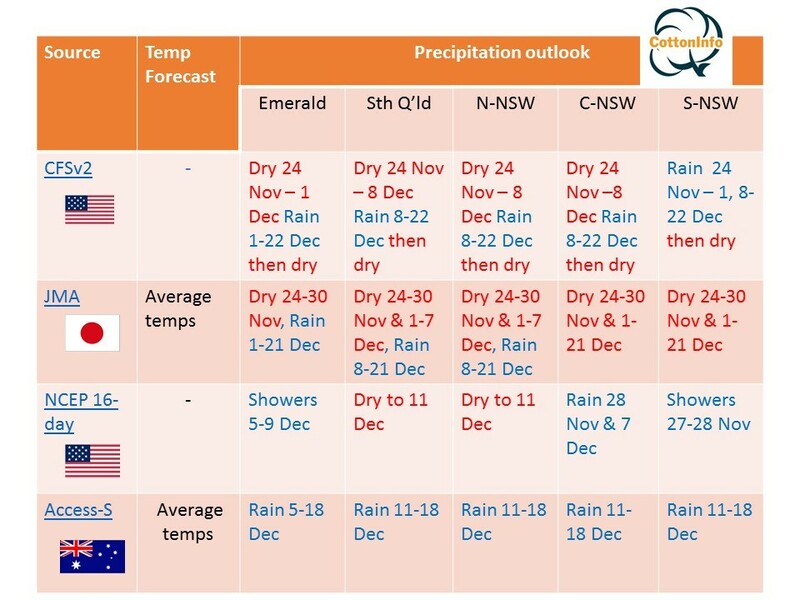 To reduce the risk of inaccuracy it is worth comparing the leading four or five international models (as we do in the fortnightly CottonInfo Moisture Manager e-newsletter) to look for consensus in their rainfall or temperature outlooks (Figure 2). Figure 2. 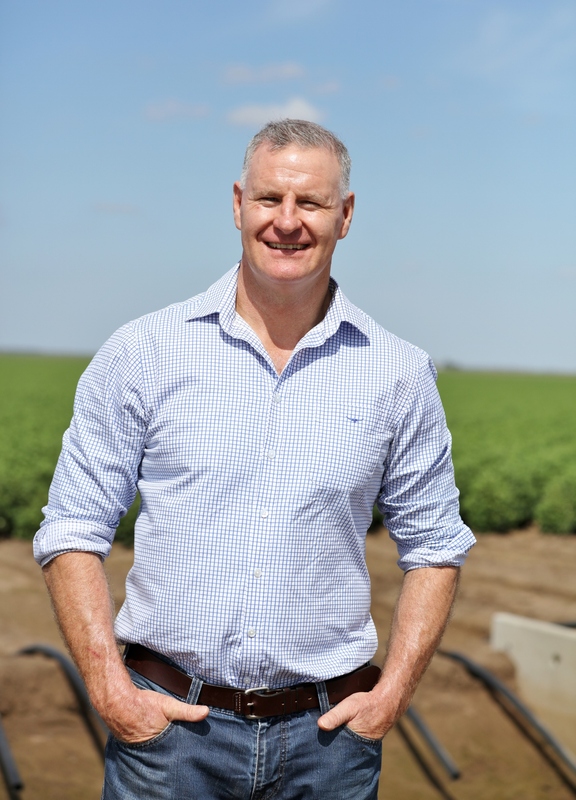 The fortnightly CottonInfo Moisture Manager e-newsletter compares the leading four or five international multi-week models to help growers look for consensus. Seasonal models provide three-months lead and are one of the most poorly understood and under-used sources of climate information. Generally, they are displayed as colour maps that indicate probabilities, but these probabilities can easily be misinterpreted. For instance, when the Bureau of Meteorology seasonal forecast displays ‘a 50 per cent chance of exceeding median rainfall’, growers need to remember that there is still a 50 per cent chance that this will not be the case. One challenge with models is that growers often think about their ‘average’ rainfall while models generally use ‘median’, which is defined as the middle value of a set of results. In most cotton growing regions, rainfall distributions are skewed because the flood years stretch the average to a value that is higher than the median. This can lead to disappointment when the rain outcome is higher than median, but still lower than the grower’s average. Seasonal forecasts also have their limitations depending on time of year. The winter and spring seasons offer the most value for seasonal forecasts due to their proven connection with the El Niño Southern Oscillation. For growers dealing with climate risk, it can be easy to become frustrated when dipping in and out of forecasts. Rather than build up hopes on the back of one good forecast, it is worth taking the time to ground-truth predictions by comparing all three types of models using a holistic or systems approach. The longer-term seasonal and multi-week models can provide the background context for short-term weather models. When seasonal and multi-week models are showing a dry signal, then there is every chance a weather system appearing on the short-term forecast will either be patchy, isolated rain or simply run out of steam in the days leading up to the event – an all too familiar occurrence in 2018. Find out more about Jon here.